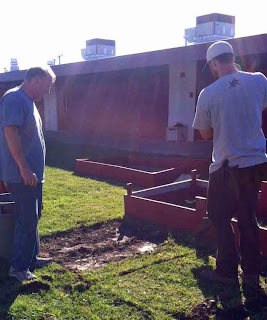 Agromin Blog: Parents Get To Work Upgrading Lee Elementary School Garden. Parents Get To Work Upgrading Lee Elementary School Garden. Lee Elementary School parents, staff, and other volunteers were busy digging trenches this month to rebuild their school gardens. The gardens were part of the school grounds that were demolished during a yearlong modernization project for the school in Los Alamitos. Renee Keeler, 2nd grade teacher and avid gardener, always includes components of science and organic gardening as her students work in the garden. She is a strong believer of the "from earth to earth" recycling process--good soil means good food, which we compost to make good soil--that then goes back to the earth. Agromin donated seven cubic yards of organic garden soil to fill the garden beds that Mrs. Keeler's classes will plant, cultivate and harvest throughout the year. The gardens are a huge hit with students, staff and parents and are a welcome returning sight to the school.